The “fusion-oratorio” Considering Matthew Shepard tells the story of the infamous 1998 murder and its aftermath. Conceived as a 21st-century oratorio-passion, Craig Hella Johnson,’s work sets texts by Lesléa Newman, Hafiz, Hildegard von Bingen, Rabindranath Tagore, W.S. Mervin, Blake, Rumi, Dante, and others in a variety of musical styles. On April 2nd at 8pm in Sanders Theater, the Harvard-Radcliffe Collegium Musicum, Harvard Glee Club, and Radcliffe Choral Society will present the East Coast premiere under the Grammy Award-winning conductor/composer. For a postconcert conversation with the audience, poet and lyricist Lesléa Newman (author of Heather Has Two Mommies among other works) will join Jason Marsden, executive director of the Matthew Shepard Foundation, Johnson, and Harvard professor Timothy Patrick McCarthy. Michael McGaghie, assistant professor of music and director of choral activities at Macalester College, will give the preconcert talk at 7pm. The project is sponsored by the Open Gate: A Fund for LGBT Life at Harvard, with support from Learning From Performers (Office for the Arts at Harvard). 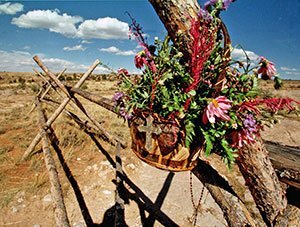 Jason Marsden, Executive Director of the Matthew Shepard Foundation tells us, “The story of Matt’s murder sent shockwaves throughout the LGBTQ+ community and the world media in 1998. To tell the life, love and death story, Craig Hella Johnson’s 100-minute oratorio draws not only on the foundational J.S. Bach settings St. Matthew Passion and St. John Passion but also on Persian mysticism, drum rituals and American genres as diverse as jazz and guitar-rock. American-Statesman freelance art critic Luke Quinton wrote [here]: “Considering Matthew Shepard is a stunning work, largely because it succeeds at being so audacious. It treats a deadly serious topic with surprising levity, and at the same time makes a shrewd connection to the heart of this darkness. The composer’s “polyphonic” essay is here.